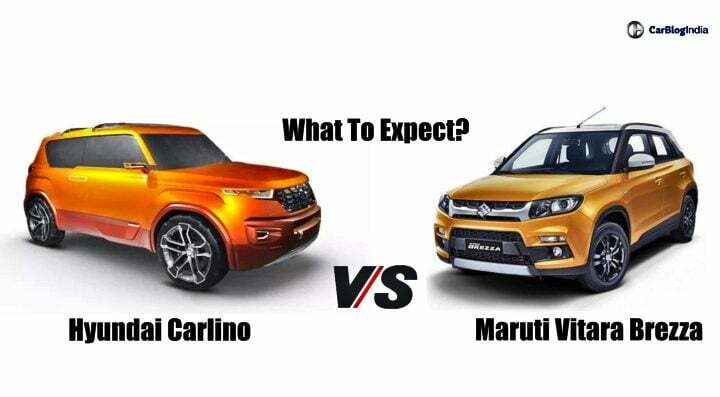 Hyundai Carlino Vs Maruti Vitara Brezza is soon going to be the battle to watch out for in the sub-compact SUV segment in India. The Maruti Vitara Brezza is currently the largest selling vehicle in its category. And even after 2 years since its launch, the demand is such that it attracts a considerable amount of waiting period. Hyundai on the other hand, at the moment, does not have any offering in the sub-compact SUV segment. However, in due course, it is going to launch the Carlino based compact SUV in India next year. In this report, we compare the upcoming Hyundai against the leading Maruti Suzuki to see what can you expect from this competition! Read Along. All the sub-compact SUVs which are currently on sale in India fall in-between the price point of INR 7.5 lakhs to INR 10.5 lakhs. The Maruti Suzuki Vitara Brezza, which comes only with a diesel engine as of now, has a base variant costing INR 7.58 lakhs. While the top of the line trim retails at INR 10.55 lakhs. Coming to the Hyundai Carlino (Read More), we expect this SUV to launch with both petrol as well as diesel derivatives. Hence, the base price could start at INR 7 lakhs. With an automatic diesel variant, its top-spec oil-burner could retail at around a price of INR 10.5 lakhs. This sub-compact SUV from Hyundai, as mentioned before, is going to launch in India with both petrol as well as diesel engines. The petrol derivative is going to come with a 1.0-litre turbocharged engine which currently does its duty on the international spec Hyundai i20. This engine churns out 118 BHp of power. The diesel derivatives will offer the Indian spec i20’s 1.4-litre U2 CRDi unit. This motor produces 88 BHP of power along with 210 NM of peak torque. The petrol engine is likely to come with a 5-speed manual gearbox as standard. On the other hand, the diesel engine is going to get a 6-speed manual gearbox. There are speculations that Hyundai will introduce an AMT gearbox in the Carlino as well. Now moving to the Vitara Brezza, as mentioned before, it is currently available in India only with a diesel derivative. This engine is a 1.3-litre DDiS unit which is sourced from Fiat. This oil-burner is capable of churning out 88 BHP along with 200 Nm of peak torque. As standard, this engine comes with a 5-speed manual gearbox. Maruti has recently introduced an AMT gearbox in Brezza’s line-up. Current media reports suggest that Maruti might introduce a petrol derivative of the Vitara Brezza in India during the first half of 2019. It will get a 1.0-litre Boosterjet engine, the same unit which powers the Baleno RS. This engine is capable of producing 101 BHP of power along with 150 NM of peak torque. It will too feature a 5-speed manual gearbox along with an AMT variant. The engine specifications of the Hyundai Carlino based sub-compact SUV still under the wraps, it would be too early to comment on the specific mileage numbers for this vehicle. However, observing the current trend, we can expect the petrol derivative of this vehicle to offer close to 12-15 km/l of mileage. While the diesel derivative is likely to offer around 18-20 km/l of the fuel-efficiency figure. Coming to the Maruti Brezza, the 1.3-litre diesel engine in this sub-compact SUV promises to offer a fuel-efficiency figure of 24.3 km/l. The new 1.0-litre Boosterjet engine, with its lightweight construction, can give around 15-16 km/l of mileage. Hyundai is yet to confirm on the dimensions that the Carlino concept based sub-compact SUV is going to come with. Hence, we can speculate that this utility vehicle will measure around 3,997mm in length, 1,780 mm in height and 1,650 mm in width. It will have a ground clearance ranging in-between 180-190 mm. The boot capacity is likely to stand around 320-litres. Talking about the Maruti Vitara Brezza, it measures 3995 mm in length, 1790 mm in height and 1,640 mm in width. It sports a ground clearance of 198 mm. The boot space stands at 328-litres. Buyers in India are not ready to compromise on basic functional features. As a result, they now want cars which offer a decent number of features and creature comforts. And the race between the automobile manufacturers to offer the best feature loaded vehicles it at full pace. Going further with this, we expect, the Carlino based compact SUV, just like its competitor Vitara Brezza, will offer a very expansive equipment list. Here are a few key features that you can expect to come on this utility vehicle.